Tuesday, the hunt was on at Shellie Neumeier's Blog. The question:What is the name of the book Shellie co-wrote with Lisa Lickel? Tammy G won a $10 Amazon gift card from April Gardner, author of Wounded Spirits. Wednesday we were led to Naomi Musch's Blog. The question: In her new release,The Red Fury, Colette's daughter Lainey is seeking solace from tragic loss and two searing rejections by doing what 2 things? B.J. Robinson won a $10 CBD gift card donated by Ann Gaylia O'Barr, author of Singing in Babylon. I'm not usually one to pick up books labeled as fantasy but whenever I have I enjoyed them--unfortunately I didn't care for this one. It wasn't the writing style, which was fine, but I didn't feel any connection at all to the characters and Prince Leo annoyed me. He seemed very immature and, well, snotty. I realize he was a child when we first met him but he remained pretty much the same throughout his young adult years. Granted, at the end of the story in his encounter with Rose Red he was truthful about himself and accepting of her so that gave him a tad more appeal but still not enough to make me want to read the next book to see what happens next. Rose Red was a decent character and her loyalty to the Prince and Southland was unfailing in spite of being cruelly treated. Are you surprised by the title of this post? Well you won't be since you now know that this is a review of Julie Lessman's latest novel, A Heart Revealed. If you are at all familiar with this series you know that drama is the key to each of these stories. If you're like me the more drama, the better and it comes in spades in this book. It's been a while since I've done one of these posts but thanks to my friend Rel @ Relz Reviewz and her great post on new Bethany House releases in Summer 2012 I had to post this! Can you imagine living in a world where chocolate is illegal and caffeine is strictly forbidden? I know this girl couldn't go on without an occasional Hershey Bar or daily glass of Mountain Dew. Oh the horror! Gabrielle Zevin, best selling author has created a world where this is reality and laws change at the drop of a hat, resulting in an underground lucrative black market where chocolate and those who control its distribution are king. Rockin' the Party @ Clash of the Titles! $10 Barnes & Noble Gift Certificate fromGail Pallotta. In the midst of all the fun and games this week, we had four authors at swordspoint with TWOClashes. All four entries were outstanding, and each possessed strong winning qualities. But, as in any race or competition, not everyone makes the finals. Like a lot of people I'm a fan of all things Jane Austen after having read Pride and Prejudice in high school I became infatuated with all things Regency--Regency romance, fashion and manners. There's just something about that time period that is so intriguing. There was so much turmoil yet wealthy families tried so hard to maintain appearances and find stability for their families in the form of wealthy (or at least titled) husbands or wives for their children. COTT Kicks Off Tournament of Champions! Those finalists were Marianne Evans and Gail Pallotta. Exciting stuff, and yet, the games weren’t done. In the next round, COTT staff cast their votes, and once again, one writer rose to the top and will advance to the next round. Katie Ann lost the love of her life. Then God offers her a new beginning in Colorado. If you haven't already done so I encourage you to check out these wonderful books and their authors. Winners have been notified and will have 48 hours to claim their prizes or another winner(s) will be selected. Okay it's no secret that I love my Pittsburgh Steelers and it's pretty widely known that Troy Polamalu is the spokesperson...errr spokeshair for Head and Shoulders. What you may not know is that Brett Keisel, popular Steelers defensive end is known in the 'Burgh and throughout Steeler Nation for his playoff (now permanent) beard. He even has a t-shirt available depicting his rather ferocious look. Well apparently Head and Shoulders thought that Brett was giving Troy a run for his money in the luscious hair department and decided to take advantage by making this commercial. If you don't at least giggle while watching this you might want to have someone check your pulse...just sayin'. A brand new Kindle FireBaby, It's Cold Outside by Susan May WarrenEnter today by clicking one of the icons below. Giveaway ends on 10/26! The Christmas Wedding is my first James Patterson book and I'm happy to say I enjoyed it. It's definitely a story to get you in the Christmas mood with family, snow, weddings and of course love! Although it's a full-length novel this reads like a novella. Each of Gaby's children are introduced and each have situations and struggles that they face that somehow get resolved right at Christmas so there's not much room for development. The romantic element is a little unbelievable--Gaby strings along three potential grooms and they don't seem to mind or question her, hence the three star review. I definitely kept wondering who the groom was going to be and by the end I was glad she chose who she did. However Patterson's ability to weave a story that's centered around true-to-life characters is, I'm sure, one of the reasons why he's a bestselling romance (and suspense!) author. Have you ever watched the tv series Ax Men? Everyday the guys face incredible dangers and hardships. Now imagine taking away almost all of their safety equipment and throwing their chainsaws over a cliff. The job would be ten times as dangerous and yet 150 years ago that's how logging was done. In her Revell debut, The Measure of Katie Calloway, author Serena Miller brings to life the logging camps of old with danger, romance, and a dash of humor. The loggers in the wilds of Michigan had very little but no matter what they always had full stomachs. A bad camp cook could be worse than a log jam on a river drive but thanks to Katie Calloway the men of Robert Foster's company ate like kings. Thanks to the wonderful people at Abingdon Press I have 2 cool book prize packs to give away. The first prize is a copy of The Faith of Ashish by Kay Marshall Strom and A Texan's Promise by Shelley Gray. The second prize winner will receive a copy of The Faith of Ashish. 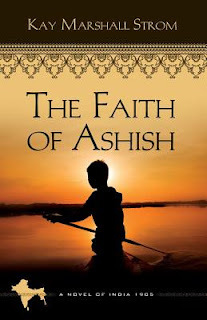 I've read The Faith of Ashish (see my review HERE) and was pleasantly surprised by the wonderful story of a little boy living in early 20th century India. I haven't had the opportunity to read all of A Texan's Promsie yet but what I've read so far is excellent. I'm sure romance fans will be pleased with this debut western from well know Amish fiction writer, Shelley Sheperd Gray. There are no words for this except... "Awwwwww!"